Crashed 8.10.1985 at low level whilst taking air to ground shorts of the 1985 British Grand Prix (Formula 1 motor race). Helicopter banked steeply to the right, and crashed south east of the Chapel Curve area of the circuit, colliding with wire fencing and the Armco Safety barrier at that part of the circuit. Of the six persons on board, there were no fatalities, but the pilot and three of the passengers were seriously injured. 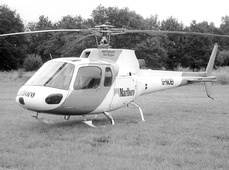 The passengers were a mixture of competition prize winners, and corporate sponsors of the Marlboro cigarette company.